Visit Our Hearing Aid Center in Denver and Speak With An Audiologist Today! Dr. Nicole Miller was born and raised in Nebraska. She earned her Bachelor of Science degree in Education and Human Sciences from the University of Nebraska- Lincoln. 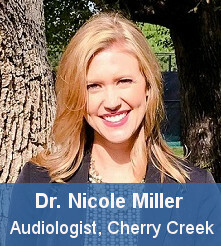 Nicole went on, and earned her Doctor of Audiology degree from the University of Kansas. Prior to her move to Denver, Dr. Miller practiced at an Otology and Neurotology clinic for four years in Nebraska. Dr. Miller has a passion for educating her patients on hearing loss, hearing loss prevention, and improving her patients hearing and communication. Mikayla Smith is a native Montanan, but has been in Colorado for a few years now. She attended Metropolitan State University where she graduated with a Bachelor’s in Speech, Language and Hearing Science with a minor in Special Education. Mikayla's hobbies outside of work include painting, pottery, sewing and anything artistic. She also enjoys gardening, cooking and, is a big fan of the outdoors especially, enjoying the sunshine and going on adventures with her Golden-doodle, Cassidy. Mikayla loves working in the Audiology profession because it is a very rewarding career and she cherishes her daily interactions with the patients, it's what she enjoys most about her job!